The database is constructed as follows: various manuscripts available on the Web today are each imported into the database individually, storing each manuscript’s word (token) separately with a unique identifier for each. After all of the individual manuscripts have been imported, they are then all merged together into a unified manuscript. The merging algorithm normalizes the text for comparison by removing all casing, diacritics, and punctuation; the unified manuscript stored in the database is composed of these normalized words. So the result of the manuscript merge is a unified manuscript which consists of every possible variant attested to by the contributing manuscripts; furthermore, all of the tokens in an individual manuscript are linked back to their corresponding words in the unified manuscript. Thus every manuscript is linked to every other manuscript by means of their links to a common point, the unified manuscript. You'll enjoy simply playing around with the Comparator. First you set configuration options. 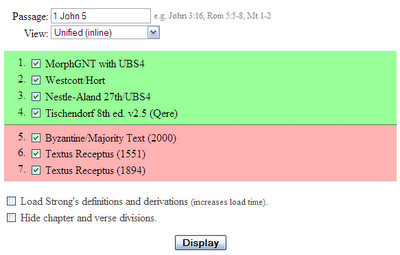 Note the seven NT texts you can use, and to them you can choose to add Strong's definitions. 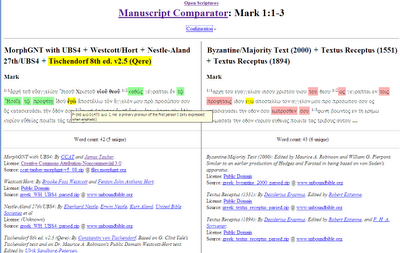 You'll want to read Ruter's description, but you can see quite easily the differences highlighted between the texts of NA, UBS, WH, and Tischendorf as compared to the Byzantine (Majority) Text and Textus Receptus. In my screen capture above, you can also see how hovering your mouse over a word in one of the parallels will highlight it in the other. If only certain versions have a particular reading, it will be highlighted in yellow in the heading. (In my example you can see where only Tischendorf includes the 1st singular pronoun.) In the hover-over popup, you can also see where morphological information is included along with--if you had chosen it in the configuration--a definition provided from Strong's. 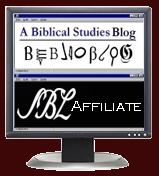 a comprehensive open-source Web repository for integrated scriptural data and a general application framework for building internationalized social applications of scripture. Thanks to Weston Ruter for sharing this excellent resource! Hey Mark, I really appreciate your encouraging words. Thanks for spreading the word! Hi Mark, works it off line??? The Comparator works entirely online. The texts are being drawn from unboundbible.org and morphgnt.org. Ruter is doing this as open source, so I'm guessing that it could be possible to run the Comparator on one's computer as long as one has also downloaded all the texts onto a the computer. You can set up the environment to work on your local machine, which is what I do for development. All of the source code is available on Google Code and all of the texts are publicly downloadable as you mentioned. The Manuscript Comparator requires that you have Apache, MySQL 5, PHP 5, Perl, and a few Perl modules installed... so unless you're a developer, it's probably too much of a hassle.